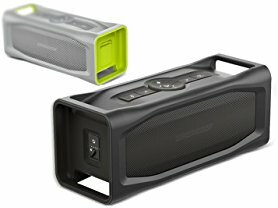 Right now these Lifeproof Aquaphonics Bluetooth Speakers start at just $79.99 (Reg. $199.99+)! Take the party wherever you go with this Bluetooth-enabled LifeProof AQUAPHONICS speaker. It's waterproof, survives meter-high drops and seals out dirt for increased longevity, and the 13/15-hour battery life keeps the music playing through the whole party. This LifeProof AQUAPHONICS speaker can connect with up to eight devices, letting you use it with your phone, tablet and laptop. Offer valid 6/14 only. Shipping is FREE for Amazon Prime Members or only $5 flat rate.